Upon arriving, a short cutscene involving Red and a giant mammoth will occur. Then the Professor will introduce you to the level and tells you to find an Elder in Icy Citadel. As soon as you gain control, turn to the left and saunter towards the penguin there. Phil'll tell you to activate his security system to open his gate. Six switches to use your electric breath on, and all in this area. Once all six are activated, go through the now opened gate behind Phil. When you get out of the short tunnel, ignore the waterwheel for now and jump down to where Peggy is standing on the ice. She'll give you a Spyro Shooter challenge to protect Peggy's playground from Eskimoles and Yetis. Complete Peggy's challenge on Easy. As with previous Spyro challenges, keep an eye on the radar as well as the shoot button pressed down, though at the start it begins slow with a few Eskimoles popping up in the ice. After a while they'll stop appearing and then Yetis will start appearing on top of the ledge ahead. When they pause in their appearances, the next wave will me a mixture of Yetis and Eskimoles concentrated on the righthand side of the playground, the Yetis are behind some trees at ground level this time. Complete Peggy's challenge on Hard. Hard Mode is much faster paced at the start then Easy was, immediately they appear in large numbers in the ice and as well a load of Yetis will also attack you, leaving little time for aiming. Keep shooting! You can destroy their projectiles once they've thrown them so don't just stop shooting if you see a barrel flying at you. Very quick shooting and swivelling is required. Behind a gate in the icy area with Peggy the penguin. Upon completion, jump back up to the waterwheel and use your water breath on it. A platform will spin up allowing you to get to a button next to a snowman. Horn Dive the button, and also kill the Eskimole hiding inside the snowman. A moving platform is what is required to get over to what you just saw. Inside a tunnel off the ice rink next to Peggy. Jump back down to the ice and head left into a tunnel. At the end of the area after Dark Gem 21, next to a locked chest. Go down the newly formed steps and into an area filled with Eskimoles. Flame them all and get to the other end where you'll find a locked chest and a Dragon Egg. The Locked Chest itself holds nothing more then four pieces of Lightning Ammo. Great. Head out of this area now, it's useless. Two doors to the left, the one with a large switch infront of it. Horn Dive it to activate it. The tunnel has a giant snowball that rolls through at intervals, follow along after it to avoid being squashed. By a snowfall across from the entrance to the area. Once destroyed it leads to Blink. 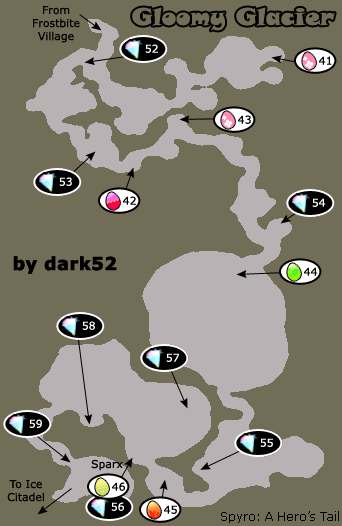 There's not that much to do in this part, head over to the opposite side of the area where there are a few Dark Shards as well as a big ol' Dark Gem. You'll find Blink in the area that Dark Gem opened up. He's all ready to go exploring again. You start off on a Bomb dispenser, so there's no need to worry about that. This starting area has a few gems, and if you look up at the top of a wall above an ice pond, you can see a digging section, you can't access this now and I don't recommend using it when you can as it's one way taking you from the end of the level right back to here, the start. Anyway, wander along and go down the tunnel here, avoid the snowballs as you go. Go over to the left and go down into an area full of skeletons and bear traps. The traps need to be destroyed with a bomb, the skeletons just take a single shot however. (HARD: There's a Dark Gem Shard up at the top of the left- hand platform, kill the large bug to get to it). Use a nice bomb on the metal door at the end to destroy it. Blow up the Dark Shard in here and go up to the right. Bomb the couple of green things and then the large blue bug as it appears. Jump down to a floating ice platform and head off to the right. Back in the previous area, go to the left and jump up the wall kick thing. Kill a couple of vines with your bombs and then use another bomb on the ice wall, step back, wait, and go past (HARD: There's a Dark Shard next to the three vines here). Jump to the crumbly platform and jump past the swinging axe to a solid platform. Jump past a second axe, make sure to time it right again. Jump exactly as the axe swings back. Then a simple jump to a dispenser solves all. Go to the right-hand edge of this platform and shoot an Eskimole and large bug over on the left, repeat for the opposite side in order to avoid getting shot at whilst you use the bars. Go and collect the gems if you want, but as always it's entirely optional whether you do or not. Either way, avoid the large bugs crawling around on the bars as they are impossible to kill here. Continue on along the bars all the way to a platform with a Dark Shard on at the bottom. Destroy the Dark Shard and then go through the diggable exit. Let Blink explore on Easy. Let Blink explore on Hard. Go to the right and blow up the metal door with a crack in, inside you'll find a Dark Gem Shard and a couple of large bugs to kill. (HARD: Go up the steps and throw a bomb at a mine covering a platform, repeat for a second mine. Then use the three platforms to get up to where an Eskimole is standing by a Dark Gem Shard). Head back out and go along the ice the other way. Go through a whole field full of Eskimoles with TNT, shooting all the way (HARD: Dark Gem Shard in the middle of the ice field). At the end, shoot a couple of skeletons and a Yeti, next to him is the next Dark Gem Shard. Turn and face the tunnel off to the left now. Shoot the two Yetis at the top before proceeding along it. There's a couple more Yeti to shoot around the next corner (HARD: Dark Shard at the corner), once they're dead, up you go and grab the final Dark Shard. Ahh. 50%. Isn't that nice? Halfway there already. Get used to Spyro again and get moving. Go into the middle of the area and up onto the top where you'll find a switch to Horn Dive. This'll open up an interesting gate, but don't go there just yet. Go as if you were going there, but when you get on the same platform as it, go to the other end and jump over to another entrance in the side of the wall. Chase an Egg Thief in the eastern area of the level. Jump down into the area below you now and chase after that Egg Thief. Inside a cave near the Egg Thief. Get back out of the area by way of a thermal, turn around and jump to a small platform across a few to the other side, into the cave, avoid the green spikey spinny thing and then kill another large armoured Gnorc. Head back out and now you can go to that gate that you opened previously. There's a reasonably tricky jump with two swinging spiked logs in here. You need to time it so that as the first log is swinging to the left you jump, but hold back so as to get past the second as it swings back to the left. You'll eventually arrive out at Moneybags' Shop 'Icy Camp' which has all the usual items. Unfortunately as you still don't have the Wall Kick ability, you can't do much here besides going through. Flame all the Eskimoles along the way and walk through the tunnel at the end. The game will take over a short way in. Meet Mammoth. Now playing as Hunter, wander down the corridor and talk to Bentley. He looks and speaks completely different from what you may remember of him from Year of the Dragon. He'll give you a task to clear out his cave of Yetis. Anyway, go to the left and follow the path along to the end. Jump onto the wall on the left which is climbable. Use it to get up Bentley's door. In the room to the right is the first Yeti. Quick shot while he's not watching. Then along the other passageway to where a second Yeti is standing with a barrel. Shoot him and then grab a fire arrow, smash the strong chest for another, though you'll need to use up the one you have in order to get that other one so I really don't know why it's there, unless it's just an example for later on of course. Inside a locked chest in Bentley's bedroom. Walk onto the blue liquid on a slope down to some more of Bentley's house. You should straight away see the third Yeti as well as a locked chest with gems inside. Continue on, and just up the next slope is the fourth Yeti to kill. Inside Bentley's bedroom is another locked chest as well, this one with an egg inside. In the next room, just off the passageway on the left is the fifth Yeti as well as another fire arrow. Either use it on the strong chest to get a free key, or use it on a cracked wall a bit further along, or both of course if you have enough left. Now wander along past the watery slope back to where Bentely was. He'll open up the rest of the level for you as well as giving you a nice shiny new Light Gem. Jump over the two spikes and climb up the newly opened ledge. Quickly shoot the yeti behind a piece of ice and grab the key if you need/can carry it. There are a couple of Dark Gem Shards after it, but there aren't any Dark Gems in the entire level, those are for Spyro's eyes only. Jump and stomp down onto each of the four switches beneath the moving hammers, avoidance is best. Once the gate is open, jump past another two spikes, shoot another Yeti and grab another key if possible. In the middle of an area just after the swinging hammers with switches. Dodge a few simple purple air vent things and get into a larger cave with a Light Gem directly ahead of you. Inside a locked chest after the first wizard guy who summons skeletons. Upon grabbing the Light Gem, the room will lock up and several enemies will appear. Mostly skeletons but also a solitary wizard inside the cave to the left. There's little point attacking him as he seems to be invincible. Kill twelve skeletons in order to reopen the doors outta here. Once it's done, he'll vanish and the door will open. Just along the corridor is a locked chest. Inside a cracked wall just after Dragon Egg 42. Just ahead is a series of jumps. You need to wait for the snowball to fall, then jump and the axe should be perfectly time for another jump, the next jump you need to watch out for falling rocks before using a fire arrow on the cracked wall there. Inside a ribcage with a Yeti. Destroy the ribs with a fire arrow. One more jump over an axe and then shoot a Yeti and a target in order to bring up another platform in order to allow you to go further. Wait for the green thing to stop spinning to get past it. Go past another and then aim up at some bats. If you're close enough to the edge they'll fly towards you allowing you to aim better, though they will hurt you if you don't shoot them in time. Also shoot a Yeti over the pass. Jump along the platforms to where that Yeti was. You'll arrive at another green spikey thing, jump past it and then fire a fire arrow at the rib cage with a Yeti behind, quickly shoot the Yeti as well. If you happen to screw up and he still lives, just go around the corner a little so that you can see him, but his snowballs hit the side, you should be able to shoot him from there. Underneath a ribcage bridge, just after Light Gem 54. Head out the tunnel now to where you should find Zoe. Go to the left side of the small platform and you will see a series of cracked platforms leading down. Jump along these. Wait for the platforms to reappear then go back up. Shoot the far-away Yeti and then proceed along the bridge. Shoot a few more bats and another Yeti over to the left before traipsing over there, the midsection will crumble so don't walk slow there. Punch the skeleton and jump over the small gap in the next bridge. Quickly punch the skeleton there and shoot the Yeti. On a ledge with a Yeti just after a couple of ribcage bridges with rolling stones on. Off to another section, Zoe starts it off again. Avoid the large rolling stone and punch the skeleton as you land before jumping over and punching the other one too. Jump forwards and onto a crumbling platform to the right and then onto a platform with a Yeti on, quickly punch him. Just after three turning ribs. Again with the waiting. Jump over to the crumbling platforms again and this time off to the right. Land on the first of the turning bones. Wait for it to turn closer to the second before jumping to it, same with the third. Shoot the Yeti ahead and wander ahead to a Sparx challenge section. Unlike all the others, this is just a plain run right to the end, no obstacles apart from plenty of bugs. It's not really a challenge that requires more then the occasional use of the generously given weapons, though they're barely needed either. Just shoot and dodge things that get too close. Hard Mode is just a little more onslaught with ground units like Eskimoles and Yetis which require more than one hit to kill. Basically the same though, if you can't hit it, zoom past it. In the area with the long climbing wall, at the far west side of the area jump up a series of crumbling platforms to get to this Light Gem. Once you've completed that Sparx challenge, move on down the corridor a little further, right to the end where Zoe is. Jump forwards onto a small platform that is moving in an arc towards (or away) from you. As it's moving, aim and shoot at a Yeti in front of you before jumping to where he was, quickly punch the skeleton there as well. If you follow the backbone along a bit further you'll find an extra fire arrow. Jump to the left onto a crumbling platform and continue up these several jumps to the top. Inside a locked room above the climbable wall, shoot a target behind a Yeti to open the gate. Head back to Zoe now, jump onto the platform with the climbable wall and climb up. You'd be best shooting a fire arrow at the bug crawling around first though. Make your way as far to the right as you can, you'll come across a second bug which you should avoid by following it anti-clockwise around a central piece of rock. Once you get off the rockface, go straight into aim mode and look opposite where you are standing, you should see a Yeti, shoot it and the target behind him. Also you should shoot a fire arrow at that previous bug as you now need to go up to above where it was patrolling. Right at the end of the level. From here you can shoot the couple of gem containers where the Yeti and target were, a fire arrow is required for the strong chest, the gems will fly towards you when you destroy their containers. Back down to where you shot the target and go through the tunnel. You'll almost straight away wander across an unstable floor, make sure not to stand on it for too long as it will crumble and fall and there's another patch right after it. If you want to kill the bear traps, just stomp on them. Jump up the gap after them to some more and a Light Gem, the last of the level. Walk a short way past and the game will take over again. Level complete. As Hunter leaves, you take control of Spyro again, right at the start of Ice Citadel. Go through to Zoe and a couple of bear traps right away. Turn right and take down the gnorc infront of some more traps and a locked chest, which has three fire ammo inside. Continue on to another Gnorc and exit the area through the large door at the end. Above a small platform in the centre of the room with Moneybags' Shop 'Cool Courtyard', use a couple of other platforms to get to it. Moneybags' Shop 'Cool Courtyard' should be directly infront of you. Use the pair of moving, spiked platforms ahead to get up to above. Once up by the waterwheel, flame the firework behind it and then go over to the opposite side of this platform where another moving platform should be. Ride it up to where you can jump onto a platform in the middle of the room. Turn on the first boiler located at the end of a tunnel near Moneybags' first shop in this level. Once that's been grabbed, jump back down to the same level as the shop and charge along to where the firework flew off to. Kill the Gnorcs as you meet them. At the end, other then the large amount of gems, behind the last Gnorc is a boiler. Use your fire breath on it to turn it on. There was a door along the tunnel, but it's currently locked and so you can't go through it. Go back to the waterwheel and activate it with water breath. This'll slide open a stong bar which now allows you to go through the door. Here you'll find a few bear traps as well as a partially sleeping Yeti, though he'll wake up as you get near. Just carry on through this tunnel until you get to the usual Horn Dive switch, you know what to do. Behind a wall just after the second boiler, it's also inside a chest. A room full to the brim with bear traps arrives. Destroy them all and fire up the boiler (no Light Gem this time) before Horn Diving another switch to get out. Go past Zoe here and at the turn to the right, go left and charge into the wall. Directly above the Elder, once destroyed you fall through. There are a few more Gnorcs and a couple of traps before the next door to go through. Inside a locked chest just after the Dragon Elder. Destroy the Dark Gem, there's nothing else to do as it's a dead-end. Though not once you destroy it. You'll fall down to Elder Astor. Talk to him and he'll give you the ability to Wall Kick. 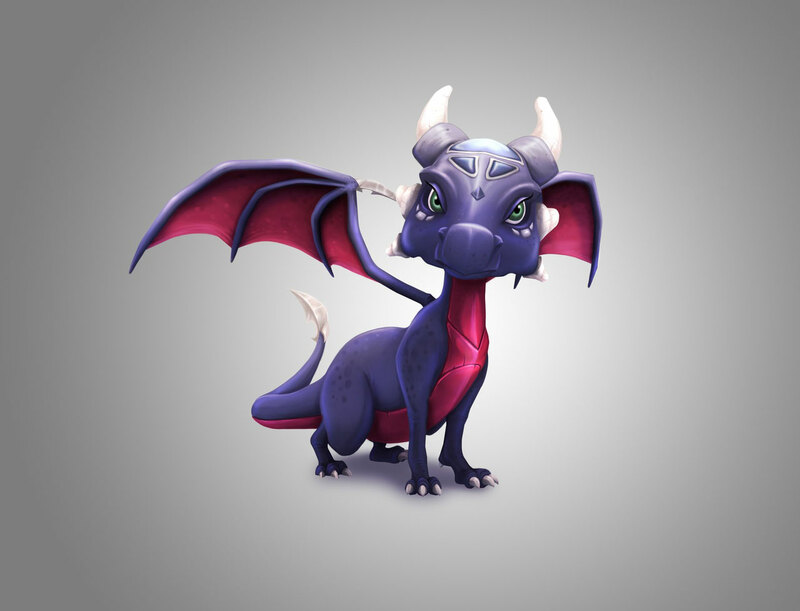 The final ability that Spyro will get from a Dragon Elder. As the door in here is locked, it is a prison after all, Wall Kick up the wall kick wall up to Zoe and a Dark Gem Shard or three. Also, you should note a locked chest just around the corner. Just kinda wander a bit further through the tunnels to the exit where Zoe and Moneybags' Shop 'Supercharge Central'. The shop's name refers to the Professor's Supercharge gadget, which should be available to you to use if you have the 40 Light Gems required, you do have enough don't you? At the end of the first supercharge green tunnel, on top of a platform. Jump on the supercharge and charge straight into the large strong door ahead, don't stop as otherwise you'll fall to Spyro's death. Charge along the green tunnel, you'll just slide back down if you run out of supercharge but most likely fall into the hole at the start, and get to the other end, there's little to get lost in. You should find yourself on a second supercharge with a Dark Gem on a platform infront of you. At the end of the supercharge tunnel opened by Dark Gem 24. This will open up a tunnel ahead of you, grab some more supercharge from behind you can glide over there, charge along the tunnel to the end above the first of the supercharges. Once you've got all those tunnels cleared, go through the cave entrance over the ice. Inside you'll find an armoured Gnorc guarding a locked chest with some fire ammo inside and round the corner an archer and some traps. Exit the tunnel at the other end where you should see a large ice giant, flame or electrify him. To the left of you is another locked chest, with electric ammo inside this time, and to the right; Sgt. Byrd. Beat Sgt. Byrd's challenge on Easy. Same as usual, this time with Rings, Time-Gates, Yetis, Gem Thieves and Albatrosses. This one is just the usual, the only things to mention are that there are a few Time-Gates and birds inside the large island and on top of the island is a thief and a Time-Gate. Beat Sgt. Byrd's challenge on Hard. For Hard mode however, you will also need to visit the lighthouse which will house several Yeti. Behind a strong door in the area near Dark Gem 25. After that, as Spyro, head back to the supercharge and use it to go through to where you were and smash into the strong door on the left. In the middle of a bridge covered in slippery ice. Speaking of Dark Gem 25, use the supercharge again to go up the icy bridge next to the place with the strong door. A thief by the shop 'Drawbridge Drop-off'. Go over the drawbridge and into an area with Moneybags' Shop 'Drawbridge Drop-off' which is also home to one of the stupidest egg thieves of the game. Really easy to catch. Very little point going any further except to get gems as this passage will now lead all the way back to Frostbite Village. So, turn around and go back now, slide down the icy bridge to where Sgt. Byrd is and go through into the building on the left of him. Inside the boiler near to Sgt. Byrd. Go through into a room with a boiler in the middle and plenty of Gnorcs around it, kill 'em all and flame the boiler. Right next to the front of that boiler is a metal cube, jump onto it and then up into a purple coloured tunnel which goes through to another boiler and Zoe. In the next room is Moneybags' Shop 'Royal Chamber' as well as the Ice Princess. She'll instruct you to light all the boilers around the citadel, luckily for her you've been doing that already though there are more to get still. Inside the locked chest here you'll get some gems. Just after the Ice Princess, it clears up the cannon here. Go through the only open exit and out into another open area. To the right of the exit is an armoured Gnorc who seems to be guarding a few Dark Gem Shards and a Darm Gem itself. After a couple of pole spins in the area off from the cannon. There are two major things to shoot with the cannon, both doors. One directly ahead, the other off to the right. Also destroy the strong chests if you want to, all gems fly towards you. Once done, head over to the left and into the entrance there. Kill the Yetis and traps to get through to Zoe at the other end. On the right you will be able to see a pair of poles to swing on, they move up and down so make sure to time the jumps so that you're above where you want to be going. After Dragon Egg 52 and a couple of pole spins. Hanging around here is an electricity powered platform, a quick jolt should get it going over to the Dark Gem. Above an upwards moving platform in the same area as the cannon. A snow covered path will appear which will lead to a Gnorc infested tunnel, kill 'em all and power up a small orb by the door at the end, which leads all the way back to the Ice Princess. Head back out to the area with the cannon and go around to the opposite side and go inside there. Behind a circular strong door in the area with the cannon. From here, glide down to the circular entrance that you smashed open with the cannon earlier. Flame the final boiler just off the area with the cannon. Jump out and round to the right and onto the last remaining entrance of the area. Work through to a room with the final boiler and several sword wielding Gnorcs. Flame the boiler to complete the task. Collect off the Ice Princess after relighting all the boilers. Using the moving platform in here will take you to a point where you can go through the locked door near the start of the level should you require to go back there or come through from there in the future. Either way, head back to the Ice Princess to collect your reward. That's this level completed. You'll never ever need to come back here again. Just gotta go finish off Frostbite Village and you can go fight this world's boss. Go all the way back to the icy bridge, use the supercharge to get back up it and work your way through, getting a new supercharge boost along the way. Next to a strong door in the tunnel from Ice Citadel. Back here after being interupted previously. Use your supercharge on the strong door next to that Light Gem and you'll find another supercharge gadget inside there too. Powerup and continue your charge through to the main part of the level, go through another strong door and you're there. Keep charging however, and go across the area to a strong door on the opposite side which should require just a little tap when you're charged up. Right next to 'Eskimole Village'. Quickly go past the spinning spikey thing and then avoid a couple of swinging spikey logs followed by another of the spinning green twigs that you need to go around. Once you do so, you'll be in an area with the shop 'Eskimole Village' as well as a Dark Gem dead ahead. On the left of the shop is a Wall Kick feature to use with an Eskimole at the top waiting for you. Proceed up another Wall Kick to where a secret area door is located. You'll require 95 Light Gems to get through it, and you probably don't have anywhere near that just yet. Jump down to the cannon that was cleared up by the Dark Gem and use it to destroy the strong door covering an entrance and for much later on, destroy a strong door up on a platform to your left. Go through the large circular one. Inside a locked chest to the right of a pool with large icicles that fall into it. Avoid some falling pieces of ice through this tunnel and as you get into a large room with a pool, you'll notice some large falling icicles in the water, as they pop back up out of the water use them as stepping stones, quickly! Go to the platform over on the right. In the room with the large falling icicles. Now, head along the icicles again and over to the Dark Gem by a large ice block on the opposite side to the way you came in. Smash it. One a platform after a couple of pole spins, all after Dark Gem 29. Go over the bridge and take out the igloo to stop the Eskimoles from respawning every time you kill 'em. Then go to the lefthand side of the bridge and drop down underneath it to a locked chest under there which contains some gems. Use the thermal to get back up again. Now, use the two pole spins to get up to where a large armoured Gnorc is standing, keep spinning until he attacks and then jump, making sure to avoid his weapon as you land. Same goes for the next one. Behind a snowy wall up a Wall Kick wall in the area by 'Icy Camp'. Now, all the way back through to the centre of the level where Moneybags' Realm Shop is. Buy a ticket to Moneybags' Shop 'Icy Camp' to save a lot of hassle though. Now with your Wall Kick ability, you can do more here then wander through. Over to the left, go up the wall and turn to the left. Jump up onto a platform ahead, turn a bit and charge into the cracked snowy wall there. Now, go over to the opposite side of the area and go up the Wall Kick area to the top there, watch out for falling icicles on the way up. At the top flame the Gnorc and jump onto the floating platform with a switch on. Activate it and glide down to the now raised cannon. Shoot the large spherical strong door straight ahead of you, then glide over towards where it was and use the wall kicks to get to it. Go through the tunnel all the way to Zoe at the other end in a large icy area. In an icy area in the south-east corner of the map. Head over to the right where you should be able to see the last Dark Gem of the Realm. In the middle of the icy area in the south-eastern corner of the map. Upon destroying said Dark Gem, several platforms will begin circling the centre pillar. Jump onto the lowest one, then glide to the next highest whilst still on there. Wait for you to get to a point where there is a slightly higher solid platform behind you and wait for the third one to arrive so you can jump on that and then jump onto the middle where a Light Gem resides. At the bottom of the steps before where Hunter waits in the south-west of the map. Go back out and glide down to the left to the tunnel which previously you lost control of Spyro in. You can continue on down it now though, go past Zoe and straight up to the Light Gem there. And that is that for now. The last remaining egg and Light Gem are both behind the 95 Light Gem door. Off to fight Red now. Head back to the central area of the level and approach the entrance to Red's Chamber just off to the right of Moneybags' Depot. The one you've been waiting for. The big bad boss battle begins! Just wander down the corridor and you'll eventually arrive at the battle scene. This time you're on ice so charging is out of the question here. The battle begins straight away with Red firing ice blasts. First strike should go either side of you, but his second will go straight at you. Use your flame breath to counter it. Keep pressing every time he makes the blast sound. After a short time he'll stop and several boxes will appear around him. Switch to water breath and knock as many boxes into him as possible, each does one damage. Three will get you to the second stage, just repeat until you've gotten him down three if you don't get it first time. He will conjure some dragon dogs for you to flame as well as some falling rocks, quickly dispense of these and get ready for some more ice attack countering. Again, he'll get tired and spawn some boxes, push as many as you can into him, three at best. If you fail to get all three in one, he'll spawn some more dogs and start fire breathing. Take out the dogs and avoid his fire, then do some more countering before finishing him off to three health. Once that's done, he'll get even madder and cause the stadium to start melting. Walk as fast as you can around him avoiding his breath as he melts it. Then avoid his ice attack as he refreezes it. He'll then set off some electric attacks, jump over the lower ones and stay on the ice for the higher ones. Almost as soon as they disappear he sends out another one, this time you need to jump between the two at the same time, so don't jump too high or too late. Then again he'll stomp causing some ice fall, and immediately start the ice attack again. Flame to counter it. It's unlikely you'll hit him more than twice here, so he'll once again repeat the process of melt, reform, electric then ice attack again with more boxes at the end until you defeat him to zero hits. Red quickly takes off leaving behind Freezia who gives you the power of Ice Breath. The final power of the game. Charge along the corridor and at the end, use your new Ice Breath on the white steam vent next to some pole spins. This turns it into a temporary extra pole to spin on. Go up two solid poles, turn and go up again. Turn and glide to a platform with another steam vent to freeze. Now just work your way all the way to the top, twisting and turning a lot. Horn Dive the switch to get out of Red's Chamber. 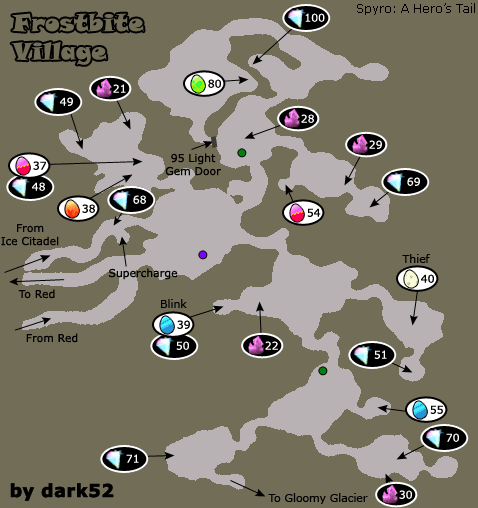 Back in Frostbite Village, make your way over to the Professor's Teleporter and go to the next Realm, Volcanic Isle. The following is written for your return to finish off previously incompletable levels, it's described as of just before the final boss with all the abilities and items collected up to there. I did it once before and I really need the last Ember egg. I allready had Flame on another profile (Which was accidently deleated) So thats ok but I NEED EMBER!! And The Music Is So Beautiful! this village is so beautiful! wait... where's the door with the crack after you let blink explore? I'm like ONE Flame egg away from playing as Flame!!! YAY!!! Unfortunately that's a known bug that I've never seen a solution for. Sorry. on the light gem # 70, the platforms are supposed to be moving after you get the dark gem. well they are not moving.... and it is the only thing i need to get in the whole game. please help me..!!!!! I hate gloomy glacier, it was more like tomb raider than spyro, there are little skeleton men and a dead person hanging off of a wall in one part! (shudder) i hate skeletons. OK umm, I need help. When the guide says "That's this level completed. You'll never ever need to come back here again. Just gotta go finish off Frostbite Village and you can go fight this world's boss. Go all the way back to the icy bridge, use the supercharge to get back up it and work your way through, getting a new supercharge boost along the way." What supercharge?? Where, and what way? And where is the supercharge gadget to get to eskimole village? This was the hardest level ever! I got seriously lost!